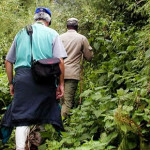 After finalizing everything with your tour operator / agent and now your gorilla permit is ready, and you packed all the necessary gear like gloves, trekking boots, long sleeved wear, rain jackets, snacks and packed lunch, walking stick (if necessary), among others, this is what you expect on the trekking day. Carry your passport with you as you head to the park headquarters for an early morning pre-tracking briefing by park officials. Your gorilla permits will be crosschecked with your passports to verify that you are the right owner of the permit. At this moment, you are expected to be ready with your packed lunch since no one is certain about the time you will take to see these gorillas. A cup of tea/ coffee is served as you are being entertained by the local traditional dancers to give you a good start of a strenuous yet exciting day, before the ranger guide gives you tips on how to conduct yourself on this trek. 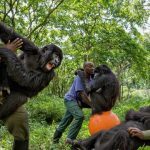 After a quick briefing on safety measures and what to expect during the day, you will be grouped in groups of 8 people maximum and each group is assigned one gorilla family to trek. Rwanda has 10 gorilla families, hence 10 groups of 8 people each are the ones allowed to track on a particular day. Assigning the groups highly depends on the fitness and age of the guests. 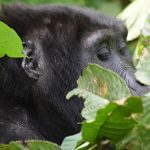 For example, those above 45 years and the ones with less fitness are assigned the ‘easy to find’ gorilla families which do not wander far away from the trail heads. 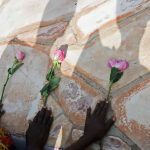 However, even those with special interests about specific groups may inform their guides to help them negotiate with rangers before assigning the groups such that they may be assigned those specific groups too. Being wild animals in their natural habitat, what may be regarded as easy to find may not necessarily be, as the animals may wander far as they search for food and therefore, it is not a guarantee that they must be near or easy to find. 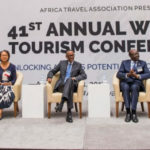 Even those which are allocated to the physically fit and energetic tourists, that are always regarded as strenuous to track, may be easily tracked on a particular day which makes the total experience interesting and un predictable. Each gorilla tracking group consists of a main guide and two scouts who carry AK-47 guns, one walking in front and another behind the group. The reason for armed scouts is for protection in the forest against wild elephants or angry, wild gorillas. The scouts are trained to fire shots into the air first in order to scare away the animals but this is only done on rarest occasions when all other options like hiding away from such dangerous animals have been done. We’ve never heard of any case where such animals attacked the tourists and the scouts had to fire bullets though on many occasions, they advise to hide or remain still until the animals go away. However the policy of the National Park is to be safe rather than sorry. Your group will also have a pair of trackers who will have been sent out in the early morning (prior to your arrival in the park) to find the location of your specific gorilla family and to assess where they may be headed. Trackers communicate the gorilla’s movements to the guide so that he can decide on the best approach to meet the gorilla family. If you do not trust your fitness, please endeavor to let your guide know such that he may help you to hire a porter at the park gate. A porter is hired between $15 to $20 depending on what he is going to carry. 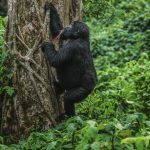 The length of your overall gorilla safari in Rwanda and the amount of time it will take to actually meet your gorilla family is said to vary widely. It may take as little as 30 minutes to find your gorilla family and as long as five to seven hours. The forest is verdant, humid and somehow light and there are no discernible trekking paths. The terrain is full of hills and steep volcano slopes where you will be required to pull yourself up steep grades by grasping onto branches, plant roots, bushes and more. Follow the lead of the guide as to the best path and form to take. If you need a break, let your guide know. It is also advisable that you carry with you some energy giving snacks and bottled mineral water to quench your thirst and give you more energy. Once your group finds the gorilla family the clock starts ticking. You are advised to stay quiet, move slowly and avoid sudden movements in order not to irritate the gorillas. Instead sit down and avoid looking directly into the eyes of the gorillas as this may also irritate them thinking that you want to fight them. It’s not a problem to look a gorilla in the eye, but if he begins charging at you, hold your ground but lower your eyes to indicate that you do not want a confrontation but rather you are submissive. Prepare your cameras and get ready to take as many photos as you want but please remember to remove the flash lights and sounds. 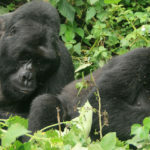 The gorillas may be feeding from the ground resting, moving around or up in the trees playing about in the branches. Try to get yourself the best view for photographs and learn all their behavior. Follow them in case they are moving but at a recommended distance which should be not shorter than 7 meters. The most important thing is you staying near your guide and following his instructions always. The trackers will often clear the brush with their machete so you can get a clearer and closer look at the gorillas. It is incredible how graceful and peaceful these animals are, especially considering their incredible size. 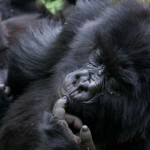 You’ll be amazed when you see the silverbacks (mature males) get up and move around showing control over the territory.